Pax Christi France has put together a series of prayers and reflections for the weeks of Advent. Each Saturday, we’ll post those reflections on the blog for the upcoming Sunday. 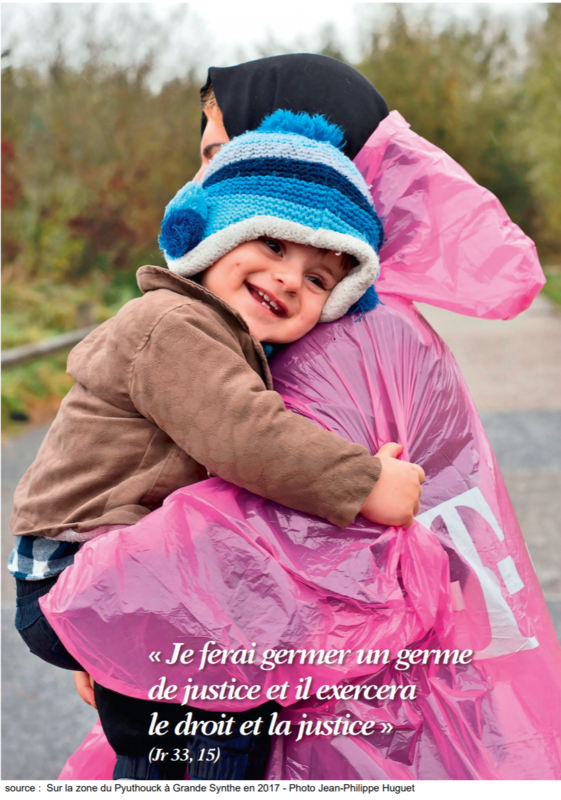 You can download the entire resource at this link in French. Since the angels’ announcement of peace at Bethlehem, St. John Paul II interpreted the growing number of refugees as one of the consequences of an endless and horrific succession of wars, conflicts, genocides and ethnic cleansing that marked the 20th century. The new century has not yet reached a turning point: armed conflicts and other forms of organised violence continue to cause displacement of populations within and beyond national borders. Because we are created “in the image of God”, each person should be deeply respected. Am I attentive to this inner reality? When Jesus sends his disciples on a mission, he asks them to enter the houses where his peace is welcomed and lived. Where are we in our own homes? Are we careful to cultivate this peace between us? Lord, disarm me, disarm us, disarm them! Lord, disarm them of their kalashnikovs, their bombs, their belts, their hatred, their thirst for vengeance, their bitterness and their ignorance. Lord, disarm us of our will to power, of our feeling of superiority, of our need to dominate, to be always right, to want to bring everything back to ourselves, to our achievements, to our knowledge, to our history. Lord, disarm me of my pride, my excuses, contempt, anger, resentment, hypocrisy, envy, my self-assurance, my sufficiency, my arrogance. Help me to strip myself little by little because when I’m weak, then I’m strong. To reach Easter, I must accept being unarmed, naked with Christ on the cross. How do we manifest this love towards our migrant brothers? In this time of Advent, are we ready to stand before the Son of Man?